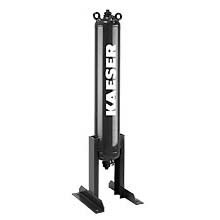 Kaeser’s activated carbon towers (KATs) virtually eliminate hydrocarbon vapors in compressed air. These single tower pressure vessels are filled with activated carbon adsorbent that adsorbs contaminants onto the surface of its internal pores. KATs are ideally suited for food and pharmaceuticals processing, and microprocessor manufacturing.